Cook the pork ribs with garlic, ginger, cloves and sweet soy sauce in a pan until the sauce has caramelized. Steam the frozen gua bao buns for 15 minutes. 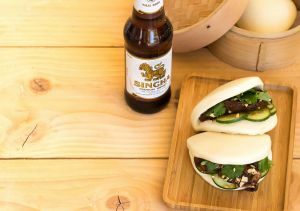 Garnish the gua bao buns with caramelized pork, sliced, cucumber, coriander and crushed peanuts.